So, the soundtrack for Black Panther is just as good as the movie. But, probably the only thing that's better than watching the movie or listening to the soundtrack? Well, that would be getting into a Black Panther Costume! Don't even think about suiting up as Black Panther without the mask, we just can't have that. Just complete your costume style with this Black Panther Mask for Men! 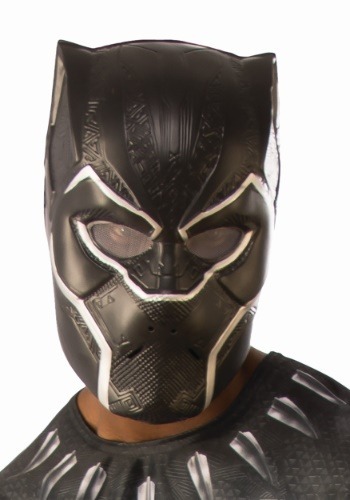 This mask is Marvel Comics officially licensed. It perfectly captures the iconic style of T'Challa's powerful suit. Plastic molded details recreate the actual suits appearance, and smoky eye lenses help conceal your true identity. We're sure all those other folks at the costume party will be super impressed when you show up in your Wakanda style! We guess you could just watch the movie instead of getting into costume, but if you're anything like us, you've already seen it at least a dozen times. So, the only thing to do is to take your fandom to a new level by putting on a Black Panther Costume. We've got all the items available right here, so check out our entire selection to get the coolest gear!